The Foxtrot is often described as waltz for music that has 4 beats instead of 3. This is mostly true, but also unfair. The Foxtrot has a more stretched out style, which gives it a certain grace. Unlike the other ballroom dances, it has a great focus on flow, and less on sudden changes in direction. Even though these changes are possible, they are less common and done with an extra smoothness. This focus on flow gives the little bit of extra grace. Because of the 4 beat music, it also has many more song options. It is not uncommon for a Foxtrot to be the dance of choice when one wants to dance gracefully to popular music. 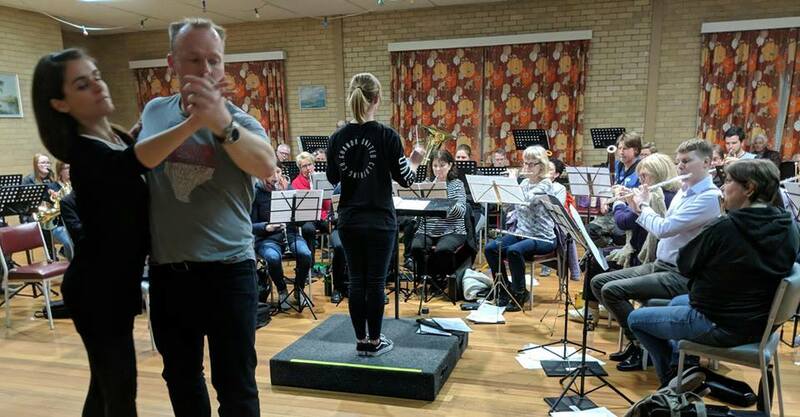 When the Southern Area Concert Band engaged two of our instructors to dance to their rendition of Beauty and Beast, Foxtrot was the perfect dance (see the image). If you like the idea of dancing in the most graceful way possible, then make sure that the Foxtrot is one of the dances covered in your free trial lesson.